That was Jo--a plump and lonely bachelor of fifty. A plethoric, roving- eyed, and kindly man, clutching vainly at the garments of a youth that had long slipped past him. Jo Hertz, in one of those pinch-waist suits and a belted coat and a little green hat, walking up Michigan Avenue of a bright winter's afternoon, trying to take the curb with a jaunty youthfulness against which every one of his fat-encased muscles rebelled, was a sight for mirth or pity, depending on one's vision. At twenty-seven Jo had been the dutiful, hard-working son (in the wholesale harness business) of a widowed and gummidging mother, who called him Joey. Now and then a double wrinkle would appear between Jo's eyes--a wrinkle that had no business there at twenty-seven. Then Jo's mother died, leaving him handicapped by a deathbed promise, the three sisters, and a three-story-and-basement house on Calumet Avenue. Jo's wrinkle became a fixture. They were not bad-looking girls, and they had a certain style, too. That is, Stell and Eva had. Carrie, the middle one, taught school over on the West Side. In those days it took her almost two hours each way. She said the kind of costume she required should have been corrugated steel. But all three knew what was being worn, and they wore it--or fairly faithful copies of it. Eva, the housekeeping sister, had a needle knack. She could skim the State Street windows and come away with a mental photograph of every separate tuck, hem, yoke, and ribbon. Heads of departments showed her the things they kept in drawers, and she went home and reproduced them with the aid of a seamstress by the day. Stell, the youngest, was the beauty. They called her Babe. Jo would pass a futile hand over the top of his head, as was his way when disturbed. "I just thought you'd like them. I thought every girl liked long white gloves. Just," feebly, "just to--to have." For a long time he didn't know what was the matter with him. He only knew he was miserable, and yet happy. Sometimes his heart seemed to ache with an actual physical ache. He realized that he wanted to do things for Emily. He wanted to buy things for Emily--useless, pretty, expensive things that he couldn't afford. He wanted to buy everything that Emily needed, and everything that Emily desired. He wanted to marry Emily. That was it. He discovered that one day, with a shock, in the midst of a transaction in the harness business. He stared at the man with whom he was dealing until that startled person grew uncomfortable. "What's the matter, Hertz?" "Matter?" "You look as if you'd seen a ghost or found a gold mine. I don't know which." "Gold mine," said Jo. And then, "No. Ghost." For he remembered that high, thin voice, and his promise. And the harness business was slithering downhill with dreadful rapidity, as the automobile business began its amazing climb. Jo tried to stop it. But he was not that kind of businessman. It never occurred to him to jump out of the down-going vehicle and catch the up-going one. He stayed on, vainly applying brakes that refused to work. "You know, Emily, I couldn't support two households now. Not the way things are. But if you'll wait. If you'll only wait. The girls might--that is, Babe and Carrie--"
"Now, look here!" Jo argued, desperately, one night. "We could be happy, anyway. There's plenty of room at the house. Lots of people begin that way. Of course, I couldn't give you all I'd like to, at first. But maybe, after a while--" No dreams of salons, and brocade, and velvet-footed servitors, and satin damask now. Just two rooms, all their own, all alone, and Emily to work for. That was his dream. But it seemed less possible than that other absurd one had been. Emily was as practical a little thing as she looked fluffy. She knew women. Especially did she know Eva, and Carrie, and Babe. She tried to imagine herself taking the household affairs and the housekeeping pocket- book out of Eva's expert hands. So then she tried to picture herself allowing the reins of Jo's house to remain in Eva's hands. And everything feminine and normal in her rebelled. Emily knew she'd want to put away her own freshly laundered linen, and smooth it, and pat it. She was that kind of woman. She knew she'd want to do her own delightful haggling with butcher and grocer. She knew she'd want to muss Jo's hair, and sit on his knee, and even quarrel with him, if necessary, without the awareness of three ever-present pairs of maiden eyes and ears. His silence was miserable assent. Then, "But you do love me. don't you, Emily?" "I do, Jo. I love you--and love you--and love you. But, Jo, I--can't." "I know it, dear. I knew it all the time, really. I just thought, maybe, somehow----"
Emily wasn't the kind of girl who would be left to pine. There are too many Jos in the world whose hearts are prone to lurch and then thump at the feel of a soft, fluttering, incredibly small hand in their grip. One year later Emily was married to a young man whose father owned a large, pie- shaped slice of the prosperous state of Michigan. "Ben says if you had the least bit of----" Ben was Eva's husband, and quotable, as are all successful men. "No, sir! No Ben is going to buy my sister's wedding clothes, understand? I guess I'm not broke--yet. I'll furnish the money for her things, and there'll be enough of them, too." Babe had as useless a trousseau, and as filled with extravagant pink-and- blue and lacy and frilly things, as any daughter of doting parents. Jo seemed to find a grim pleasure in providing them. But it left him pretty well pinched. After Babe's marriage (she insisted that they call her Estelle now) Jo sold the house on Calumet. He and Carrie took one of those little flats that were springing up, seemingly overnight, all through Chicago's South Side. There was nothing domestic about Carrie. She had given up teaching two years before, and had gone into social-service work on the West Side. She had what is known as a legal mind--hard, clear, orderly--and she made a great success of it. Her dream was to live at the Settlement House and give all her time to the work. Upon the little household she bestowed a certain amount of grim, capable attention. It was the same kind of attention she would have given a piece of machinery whose oiling and running had been entrusted to her care. She hated it, and didn't hesitate to say so. "Away? Away from here, you mean--to live?" But Ben and George didn't want to take, f'rinstance, your raw hides and leathers. They wanted, when they took anything at all, to take golf, or politics, or stocks. They were the modern type of businessman who prefers to leave his work out of his play. Business, with them, was a profession-- a finely graded and balanced thing, differing from Jo's clumsy, down- hill style as completely as does the method of a great criminal detective differ from that of a village constable. They would listen, restively, and say, "Uh-uh," at intervals, and at the first chance they would sort of fade out of the room, with a meaning glance at their wives. Eva had two children now. Girls. They treated Uncle Jo with good-natured tolerance. Stell had no children. Uncle Jo degenerated, by almost imperceptible degrees, from the position of honored guest, who is served with white meat, to that of one who is content with a leg and one of those obscure and bony sections which, after much turning with a bewildered and investigating knife and fork, leave one baffled and unsatisfied. "Just drop in any time during the week," Stell said, "for dinner. Except Wednesday--that's our bridge night--and Saturday. And, of course, Thursday. Cook is out that night. Don't wait for me to phone." He bought a car. Naturally. A glittering affair; in color a bright blue, with pale-blue leather straps and a great deal of gold fittings, and special tires. Eva said it was the kind of thing a chorus girl would use, rather than an elderly businessman. You saw him driving about in it, red-faced and rather awkward at the wheel. You saw him, too, in the Pompeian Room at the Congress Hotel of a Saturday afternoon when roving-eyed matrons in mink coats are wont to congregate to sip pale-amber drinks. Actors grew to recognize the semibald head and the shining, round, good- natured face looming out at them from the dim well of the theater, and sometimes, in a musical show, they directed a quip at him, and he liked it. He could pick out the critics as they came down the aisle, and even had a nodding acquaintance with two of them. "Kelly, of the Herald," he would say carelessly. "Bean. of the Trib. They're all afraid of him." The war went on, and on, and on. And the money continued to roll in-- a flood of it. Then, one afternoon, Eva, in town on shopping bent, entered a small, exclusive, and expensive shop on Michigan Avenue. Eva's weakness was hats. She was seeking a hat now. She described what she sought with a languid conciseness, and stood looking about her after the saleswoman had vanished in quest of it. The room was becomingly rose-illumined and somewhat dim, so that some minutes had passed before she realized that a man seated on a raspberry brocade settee not five feet away-- a man with a walking stick, and yellow gloves, and tan spats, and a check suit--was her brother Jo. From him Eva's wild-eyed glance leaped to the woman who was trying on hats before one of the many long mirrors. She was seated, and a saleswoman was exclaiming discreetly at her elbow. "He looked straight at me. My dear, I thought I'd die! But at least he had sense enough not to speak. She was one of those limp, willowy creatures with the greediest eyes that she tried to keep softened to a baby stare, and couldn't, she was so crazy to get her hands on those hats. I saw it all in one awful minute. You know the way I do. I suppose some people would call her pretty. I don't. And her color. Well! And the most expensive- looking hats. Not one of them under seventy-five. Isn't it disgusting! At his age! Suppose Ethel had been with me!" "Well, of all things!" exclaimed Stell. A book on the war, by an Englishman. A detective story of the lurid type that lulls us to sleep. His shoes ranged in a careful row in the closet, with a shoe tree in every one of them. There was something speaking about them. They looked so human. Eva shut the door on them quickly. Some bottles on the dresser. A jar of pomade. An ointment such as a man uses who is growing bald and is panic- stricken too late. An insurance calendar on the wall. Some rhubarb-and- soda mixture on the shelf in the bathroom, and a little box of pepsin tablets. "Where do you suppose he can be?" she demanded. "It's"--she glanced at her wrist--"why, it's after six!" "Why--Eve! Why, Babe! Well! Why didn't you let me know?" The little fists kept up their frantic beating and pushing. And a voice--a choked, high little voice--cried, "Let me by! I can't see! You MAN, you! You big fat man! My boy's going by--to war--and I can't see! Let me by!" "Why, Emily, how in the world----!" "There he is," Emily shrilled, above the din. "There he is! There he is! There he----" And waved a futile little hand. It wasn't so much a wave as a clutching. A clutching after something beyond her reach. Somehow, miraculously, he had picked him from among the hundreds. Had picked him as surely as his own father might have. It was Emily's boy. He was marching by, rather stiffly. He was nineteen, and fun-loving, and he had a girl, and he didn't particularly want to go to France and--to go to France. But more than he had hated going, he had hated not to go. So he marched by, looking straight ahead, his jaw set so that his chin stuck out just a little. Emily's boy. Another minute and the boy had passed on up the broad street--the fine, flag-bedecked street--just one of a hundred service hats bobbing in rhythmic motion like sandy waves lapping a shore and flowing on. Emily was clinging to Jo. She was mumbling something, over and over. "I can't. I can't. Don't ask me to. I can't let him go. Something gathering in Jo's face should have warned her. But he was slumped down in his chair in such a huddle, and he looked so old and fat that she did not heed it. She went on. "You've got us to consider. Your sisters. And your nieces. Not to speak of your own----"
"No!" "Why not? You sound as if you'd been sleeping. Look here----"
He stood staring at the instrument with unseeing eyes. Then he turned and walked into the front room. All the light had gone out of it. Dusk had come on. All the light had gone out of everything. The zest had gone out of life. The game was over--the game he had been playing against loneliness and disappointment. And he was just a tired old man. A lonely, tired old man in a ridiculous rose-colored room that had grown, all of a sudden, drab. 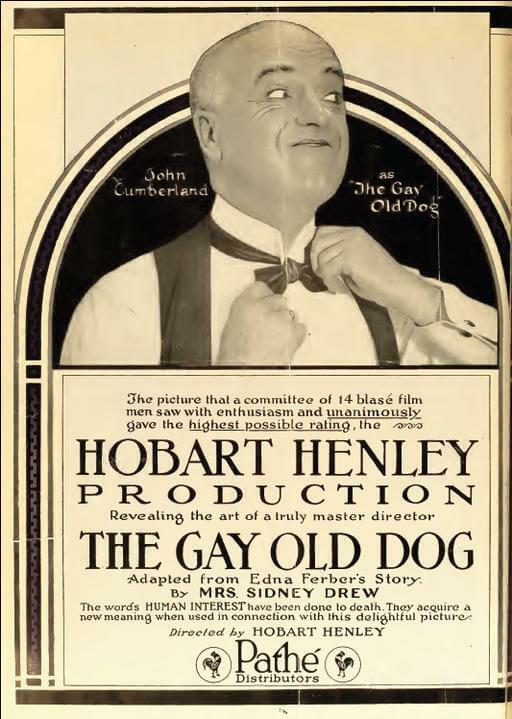 Add The Gay Old Dog to your own personal library.